The FREMM ("European multi-purpose frigate"; French: Frégate européenne multi-mission; Italian: Fregata europea multi-missione) is a class of multi-purpose frigates designed by Naval Group and Fincantieri for the navies of France and Italy. The lead ship of the class, Aquitaine, was commissioned in November 2012 by the French Navy. In France the class is known as the Aquitaine class, while in Italy they are known as the Bergamini class. Italy has ordered six general purpose variants and four anti-submarine variants. France has ordered six anti-submarine variants, and two air-defence variants. The class is one of the five finalists for the U.S. Navy’s FFG(X) program. Three original variants of the FREMM were proposed; an anti-submarine variant (ASW) and a general-purpose variant (GP) and a land-attack variant (AVT) to replace the existing classes of frigates within the French and Italian navies. A total of 27 FREMM were to be constructed - 17 for France and 10 for Italy - with additional aims to seek exports, however budget cuts and changing requirements has seen this number drop significantly for France, while the order for Italy remained invaried. The land-attack variant (AVT) was subsequently cancelled. A third anti-air warfare variant of FREMM was proposed by DCNS in response to French requirements for a new air-defence frigate, the new variant became known as FREDA ("FREgates de Défense Aériennes", "Air defence frigate"). This new French requirement was due to the third and fourth Horizon-class frigates being cancelled after the first two cost €1.35B each, but this decision left French Navy still in-need of replacements for its ageing Cassard-class air-defence frigates. As of 2009, the FREDA design features a more powerful version of the Herakles (radar) passive electronically scanned array radar and 32 cells of SYLVER A50 in place of the 16 cells of A43 and 16 cells of A70. The SYLVER A50 would allow it to fire the 120 kilometres (75 mi)-range Aster 30 missile; the towed array sonar would not be fitted. At Euronaval 2012 DCNS showed a new concept called FREMM-ER for the FREDA requirement, again based on the FREMM, but specifically mentioning the ballistic missile defence mission as well as anti-air. FREMM-ER has a modified superstructure replacing Héraklès with the new Thales Sea Fire 500 radar, whose four fixed plates resemble those of the US Navy's AN/SPY-1. However unlike the Héraklès and the SPY-1 (both using passive electronically scanned array technology), the Sea Fire 500 has active electronically scanned array antennas. Original plans were for 17 FREMM to replace the nine D'Estienne d'Orves-class avisos and nine anti-submarine frigates of the Tourville and Georges Leygues classes. In November 2005 France announced a contract of €3.5 billion for development and the first eight hulls, with options for nine more costing €2.95 billion split over two tranches (totaling 17). Following the cancellation of the third and fourth of the Horizon-class frigates in 2005 on budget grounds, requirements for an air-defence derivative of the FREMM called FREDA were placed – with DCNS coming up with several proposals. Expectations were that the last two ships of the 17 FREMM planned would be built to FREDA specifications; however, by 2008 the plan was revised down to just 11 FREMM (9 ASW variants and 2 FREDA variants) at a cost of €8.75 billion (FY13, ~US$12 billion). The 11 ships would cost €670 million (~US$760m) each in FY2014, or €860m (~US$980m) including development costs. The 2013 White Paper on Defence and National Security committed France to 15 front-line frigates, which was initially interpreted as 2 Horizons, 5 La Fayettes and a reduction in the FREMM fleet down to 8 ships. The 2014/2019 defence plan restated a target of 11 frigates; the current[when?] plan is to deliver six ASW FREMM variants to replace the Georges Leygues-class frigates by 2019, followed by two anti-air variants to replace the ageing Cassard-class frigates and a decision will be taken in 2016 on what version the remaining three will be. In 2014, the French Navy's Chief of Staff, Adm. Bernard Rogel, confirmed that 11 FREMM frigates had been ordered but in 2015 the order was cut to 8 in order to allow the purchase of five FTI Mid-Size frigates from 2023. The FTI will replace the La Fayette-class class, which will be fitted with a sonar as an interim measure. Planning assumptions for the Italian Navy are 10 FREMM-IT (4 ASW variants and 6 GP variants) at a cost of €5.9 billion. FREMM-IT will replace the Maestrale and Lupo-class frigates in service with the Italian Navy. In the 2013 Italian budget, the Italian government laid out the necessary financing for two more GP variants (FREMM-IT 7 & 8) and the contract was awarded in September 2013. On 15 April 2015, the Italian Parliament confirmed the deal between OCCAR and Orizzonte Sistemi Navali Spa (Fincantieri and Finmeccanica, since 2017 Leonardo) to begin building units 9 and 10, for 764 million Euros. As of 16 April 2015, the Italian government has approved funding for all ten FREMM-IT to be delivered to the Italian Navy (4 ASW variants and 6 GP variants). FREMM-IT 9 & 10 will have undisclosed enhanced capabilities. All 10 Italian FREMM-ITs have extended AAW capabilities, with SAAM-ESD CMS, Aster 30 and Aster 15 missiles for extended area defence. SAAM-ESD CMS use Leonardo MFRA, a 3D active radar (AESA), an evolved version of the Leonardo EMPAR PESA radar (previously embarked on Horizon-class destroyers and the aircraft carrier Cavour). Since the 7th FREMM-IT, there will be updates, such as new conformal IFF antenna and much more stealth response. Since the 9th FREMM-IT, SCLAR-H replaced with Leonardo ODLS-20. In 2017 the Italian FREMM refit started with the installation on each of 2 SITEP MS-424 acoustic guns. 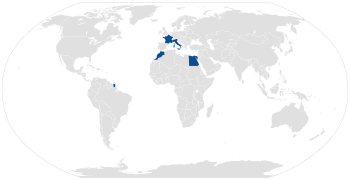 Operators of the FREMM frigates. On 10 July 2017 it was reported that the US Congress is pushing foreign designs such as the Fincantieri FREMM for the FFG(X) Guided-Missile Frigate Program. According to Representative Rob Wittman, chairman of the United States House Armed Services Subcommittee on Seapower and Projection Forces, the United States Congress is comfortable with models such as Fincantieri's partnership with Lockheed Martin to build the Freedom version of the LCS. If the Italian FREMM design is selected, the Marinette Marine shipyard in Wisconsin, part of the Fincantieri group, would build the guided-missile frigates. Marinette Marine is best known for the US Navy Freedom-class littoral combat ship. On 16 February 2018 Fincantieri Marine was one of five companies which were each awarded a $15 million contract for conceptual design of the frigates, which the Navy will evaluate over 16 months ahead of a final request for proposal in 2019 and a contract award in 2020. As of January 2019, 7 Freedom-class littoral combat ships have been commissioned for the US Navy, 2 more ships are being fitted out, 4 more are under construction and 3 are on order. On 30 June 2017, it was announced that Leonardo and BAE Systems will collaborate to provide the US military forces with a wide range of upgraded munitions for advanced, large-calibre weapon systems such as the Leonardo Vulcano and Strales/DART guided munitions. From late May to early June 2018, the Italian Navy deployed Alpino on a good will visit to the United States along the Eastern seaboard, making port calls in Norfolk, Baltimore, New York City, and Boston. She was visited by several US Navy officials who toured her as a potential candidate for the US Navy's FFG(X) program. Among the visitors, was Italian Ambassador to the United States, Armando Varrichio. On 24 October 2007 it was announced that the Royal Moroccan Navy had ordered one FREMM to replace its Descubierta-class corvette. The contract was signed on 18 April 2008 and construction of the Moroccan FREMM began in the summer 2008 with delivery expected in 2012 or 2013; Mohammed VI was launched in September 2011 and handed over on 30 January 2014. The Moroccan ship is similar to the French anti-submarine version, without SYLVER A70 tubes for SCALP Naval, and cost €470m. On 22 January 2009 the Hellenic Navy announced an order for six FREMM to replace an equal number of Elli-class frigates. After the Greek government-debt crisis this was cut down to between two and four ships equipped with SCALP Naval, with France alleged to have offered them to Greece at no cost for the first five years. Germany objected to this deal in October 2011 and no deal has been signed. In February 2013 though and during the formal visit of the President of France, François Hollande, in Athens, according to press reports an agreement which includes the long-term leasing of two FREMM frigates (Normandie and Provence according to initial reports) to the Hellenic Navy has been reached. On 12 January 2018 the Greek daily newspaper Kathimerini reported that the Greek government is set to enter talks with France regarding the procurement of two FREMM frigates, with an option for an additional two. Contacts between Greece and France will begin initially at a military level, starting in February 2018. In April 2018, Greek deputy Minister for National Defence Fotis Kouvelis stated that an agreement between France and Greece has been reached for a five-year lease of 2 FREMM frigates, which could be handed over as early as August 2018. After few days, on 25 April 2018 the Greek minister of Defense Panos Kammenos denied any information regarding the purchase of two frigates from France. In April 2013, the French government showcased the FREMM class in Halifax with the hope of selling to the Royal Canadian Navy for the Single Class Surface Combatant Project. Canada's Defence Minister at the time, Peter MacKay, commented "I have never seen… such an impressive vessel". DCNS is widely considered one of the leading bidders towards the Single Class Surface Combatants. In September 2017, a variant of the FREMM was offered directly to the Ministry of Defence, outside of the preferential contractor; in an attempt to protect intellectual property & technology. This direct bid includes fast-delivery of 2019 for the 1st ship if accepted within the year and a fixed price of just $30 billion for all 15 ships, versus the $62 billion estimated for the government's prime-contractor ship building plan. In December 2017 however, it became clear that the offer was rejected by the Public Services and Procurement Canada, citing the unsolicited nature of the bid as undermining the fair and competitive nature of the procurement". In April 2016, Prime Minister Malcolm Turnbull confirmed that the Italian FREMM class was one of three frigates shortlisted for the Royal Australian Navy's Anzac-class frigate replacement. In September 2016, Fincantieri signed a contract to participate in the Competitive Evaluation Process, conducted by the Department of Defence for nine Future Frigates for the Royal Australian Navy. In June 2018, the contract was awarded to BAE Systems. In January 2019, the Italian government made an offer of two Bergamini-class frigates to the Brazilian Navy. The frigates Spartaco Schergat and Emilio Bianchi under construction for the Italian Navy, would be transferred to Brazil for €1.5 billion (R$6.37 billion). 2 x SOFRESUD Quick Pointing Devices "QPD"
The last two ASW variants have been fitted with 16 cells MBDA A50 VLS for MBDA Aster 30 to be used if deemed necessary. 16 cells MBDA SYLVER A70 VLS for MBDA SCALP Naval cruise missile with a range up to 1000 km or Aster 30 anti air missile. ^ a b c d "Projet de loi de finances pour 2015 : Défense : équipement des forces" (in French). Senate of France. 20 November 2014. Retrieved 2015-02-22. ^ a b c d e Djama, Nasser (30 January 2014). "A Brest, le Maroc prend possession de sa frégate Fremm Mohammed VI". L'Usine Nouvelle (in French). Retrieved 24 October 2014. ^ "Caractéristiques". FREMM Aquitaine (D 650) (in French). Minstère de la Défense. 12 August 2013. Retrieved 24 October 2014. ^ "Fregate Europee Multi Missione - FREMM" (in Italian). Ministero Della Difesa. Retrieved 24 October 2014. ^ "Fincantieri - Classe Bergamini". www.fincantieri.com. Retrieved 11 April 2018. ^ a b "FREMM : 11 frégates multi-missions pour la flotte française". Mer et Marine (in French). 26 October 2008. ^ "Frégates : Le point sur les futures FREDA". Mer et Marine (in French). 12 October 2009. ^ Nodwell, Bethan (2013). "Extending Navy Capabilities FREMM-ER". FrontLine Defence. Archived from the original on 2014-10-25. Retrieved 24 October 2014. ^ "FREMM : Supprimer des frégates, un non sens économique et stratégique?". Mer et Marine (in French). 19 September 2007. ^ "White Paper on Defense and National Security 2013" (PDF). Minstère de la Défense. 29 April 2013. p. 91. Retrieved 24 October 2014. ^ "Projet De Loi De programmation Militarie 2014/2019" (PDF) (in French). Minstère de la Défense. August 2013. Archived from the original (PDF) on 2015-09-24. Retrieved 24 October 2014. ^ a b "Update to French Military Planning Law Means New Capabilities for Lafayette Class Frigates". Navy Reocgnition. 2015-05-21. ^ "Fincantieri - Bergamini Class". www.fincantieri.com. Retrieved 11 April 2018. ^ Freedberg, Sydney J. (2017-07-10). "Navy Steers Well Away From An LCS Frigate". Breaking Defense. Retrieved 14 October 2017. ^ Larter, David B. (2017-09-01). "The US Navy eyes foreign designs". Defense News. Retrieved 14 October 2017. ^ "Navy Picks Five Contenders for Next Generation Frigate FFG(X) Program". U.S. Naval Institute. Retrieved 2018-02-16. ^ "BAE Systems and Leonardo to partner for new Vulcano precision-guided munitions". Naval Technology. 2017-06-30. ^ "ITS Alpino, prototype competitor for next Navy frigate, makes landfall in Norfolk". wtkr.com. 25 May 2018. Retrieved 12 July 2018. ^ ΑΠΟΚΛΕΙΣΤΙΚΟ: O Ε. Μεϊμαράκης ανακοίνωσε πρόγραμμα εξοπλισμών (in Greek). DefenceNet.gr. 23 January 2009. Archived from the original on 2012-04-19. Retrieved 24 October 2014. ^ "Germans Question Contract : France to Sell Frigates to Greece in Controversial Deal". Der Spiegel. 17 October 2011. Retrieved 24 October 2014. ^ "La Grèce va louer 2 frégates françaises". Le Figaro (in French). 19 February 2013. Retrieved 24 October 2014. ^ "Greece to negotiate FREMM Frigate acquisition with France". Navy Recognition. 15 January 2018. Archived from the original on 16 January 2018. Retrieved 16 January 2018. ^ Adamowski, Jaroslaw (17 January 2018). "Greece to launch talks with France over FREMM frigates, corvettes". Defense News. Warsaw, Poland. Archived from the original on 18 January 2018. Retrieved 18 January 2018. ^ Tigkos, Kostas; Alex, Pape (20 April 2018). "Hellenic Navy moves closer to leasing FREMM frigates from France". IHS Jane's 360. London. Archived from the original on 20 April 2018. Retrieved 5 May 2018. ^ "French pitch new warships for next Canadian navy vessels". CBC News. 20 April 2013. Retrieved 24 October 2014. ^ Brewster, Murray (2016-10-26). "Frigate replacement program kicks off with design competition". CBC News. ^ Tran, Pierre (2017-12-04). "European firms jointly offer frigate to Canadian government, skipping shipbuilder". Defense News. Retrieved 2017-12-05. ^ Tran, Pierre; Kington, Tom; Pugliese, David (6 December 2017). "Bold move backfires as Canada declines Naval Group-Fincantieri frigate offering". Defense News. Paris, Rome and Victoria, British Columbia. Archived from the original on 16 January 2018. Retrieved 16 January 2018. ^ "FREMM pour l'Egypte: Ça se précise..." 17 December 2014. Retrieved 18 January 2015. ^ a b "DCNS Transferred the FREMM Frigate Tahya Misr to the Egyptian Navy". 24 June 2015. ^ "Un satellite Airbus-Thalès vendu à l'Egypte". 19 April 2016. ^ "DCNS Transfers the FREMM Tahya Misr to the Egyptian Navy". 24 June 2015. ^ "Egypt receives its first FREMM frigate". Janes.com. 25 June 2015. Retrieved 12 May 2016. ^ Anderson, Stephanie (18 April 2016). "Malcolm Turnbull says 12 offshore patrol vessels to be built in Adelaide". ABC News. ABC News (Australia). Retrieved 18 April 2016. ^ "Fincantieri Signs the Future Frigate Participant Services Contract". 2016-09-01. ^ Lopes, Roberto (30 January 2019). "Itália oferece fragatas FREMM ao Brasil". Poder Naval. Retrieved 30 January 2019. ^ "Stemar RIB 6.8 MM" (in Italian). FNN Marine Diesel Engine. Retrieved 30 April 2015. ^ "La Marine réceptionne la FREMM Aquitaine" (in French). Minstère de la Défense. 27 November 2012. Retrieved 24 October 2014. ^ "DCNS delivers multi-mission frigate Auvergne, the fourth FREMM for the French Navy". dcnsgroup.com. 11 April 2017. Retrieved 11 April 2017. ^ "La FREMM Auvergne admise au service actif". Mer et Marine (in French). 2018-03-07. Retrieved 2018-03-19. ^ "Naval Group met à l'eau sa 8ème FREMM". 2 February 2018. Retrieved 11 April 2018. ^ "Egypt receives its first FREMM frigate". 23 June 2015. ^ "Egypt's Sisi attends navy manoeuvre, raises flag over new frigate". english.ahram.org.eg. 17 March 2016. ^ "La FREMM Tahia Misr en route pour Alexandrie" (in French). 23 July 2015. ^ Gaiani, Gianandrea (26 November 2012). "Modifiche E Qualche Ritocco Per Le Fremm" (in Italian). Analisi Difesa. Retrieved 24 October 2014. ^ "The first multipurpose frigate launched: the "Carlo Bergamini"" (Press release). Trieste: Fincantieri. 16 July 2011. ^ "Italian FREMM FOC GP Carlo BERGAMINI Delivered To The Italian Navy" (Press release). OCCAR. 29 May 2013. ^ "Second multipurpose frigate launched: Virginio Fasan" (Press release). Trieste: Fincantieri. 31 March 2012. ^ "Second Italian FREMM frigate 'Virginio Fasan' Delivered". Orizzonte Sistemi Navali. 19 December 2013. Archived from the original on 24 January 2012. Retrieved 24 October 2014. ^ "The first multipurpose frigate launched: the "Carlo Margottini"" (Press release). Trieste: Fincantieri. 29 June 2013. ^ "FREMM again" (Press release). OCCAR. 27 February 2014. ^ "CARABINIERE: 4th Italian FREMM launched" (Press release). OCCAR. 29 March 2014. ^ "FREMM "Carabiniere" delivered to the Italian Navy" (Press release). Trieste: Fincantieri. 28 April 2015. ^ "The fifth multipurpose frigate launched - the "Alpino"" (Press release). Trieste: Fincantieri. 13 December 2014. ^ "FREMM "Alpino" delivered to the Italian Navy" (Press release). Trieste: Fincantieri. 30 September 2016. ^ "The sixth multipurpose frigate "Luigi Rizzo" launched" (Press release). Trieste: Fincantieri. 19 December 2015. ^ "FREMM "Rizzo" delivered to the Italian Navy" (Press release). Trieste: Fincantieri. 20 April 2017. ^ "Fincantieri, Riva Trigoso: iniziati i lavori per la settima Fremm" (in Italian). The Medi Telegraph. 5 June 2014. Retrieved 24 October 2014. ^ "The seventh multipurpose frigate "Federico Martinengo" launched" (Press release). Trieste: Fincantieri. 4 March 2017. ^ "FREMM "Federico Martinengo" delivered to the Italian Navy" (Press release). Trieste: Fincantieri. 24 April 2018. ^ "Laying down Ceremony for the 8th Italian FREMM" (Press release). OCCAR. 12 July 2015. ^ "Riva Trigoso: Fincantieri, Iniziano Lavori 8ª Unità Programma FREMM" (in Italian). Agenzia Giornalistica Globalpress. 25 February 2015. Archived from the original on 2 April 2015. Retrieved 30 April 2015. ^ "The eighth multipurpose frigate "Antonio Marceglia" launched" (Press release). Trieste: Fincantieri. 3 February 2018. ^ "FREMM "Antonio Marceglia" delivered to the Italian Navy" (Press release). Trieste: Fincantieri. 16 April 2019. ^ "FREMM-IT". www.portaledifesa.it. Retrieved 11 April 2018. ^ "The ninth multipurpose frigate "Spartaco Schergat" launched" (Press release). Trieste: Fincantieri. 26 January 2019. Wikimedia Commons has media related to FREMM class frigates.